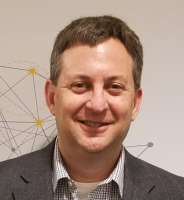 Paul Mauschbaugh, Director of Analytics, Caterpillar Inc.
Just as Davenport’s model suggests, the transition from being data-centric, to KPI-centric, to adopting advanced analytics capabilities is in fact a step-by-step process. Skipping any step in that journey will likely lead to failure. In the instance of our failed predictive models from ten years ago, those very same models are now used every day, and generating significant value. The first hill to conquer in that journey was to gain accountability for the quality of the data within the business community. It is very easy for the business to point the finger at the Information Technology organization when dirty data is prevalent, but most of us understand that the root cause of dirty data is much more likely to be found in a lack of process discipline. Gaining accountability for the process discipline and thus the data that is output from that process is a leadership challenge … and a potentially daunting one at that. Establishing KPI’s for each line of business, and automating the reporting of data against those KPI’s is one effective way to drive such accountability. Leaders need to be staunch in their position that the data isn’t wrong in this scenario. Over time, business users will become accustomed to “their data” and how it shows they are progressing towards “their goals,” and a data-driven culture can emerge. This is the progression through Davenport’s Stage 3 in Analytic Maturity. KPI’s that measure the results of those business users (and those users accepting accountability for the quality of their data). Then and only then will your organization be able to achieve the significant value potential a Data Scientist can bring through predictive models. Your investment decisions should be grounded in how they will help enable these steps, and knowing that without strong leadership support and key business targets for success, you will not likely get a positive return on that investment. 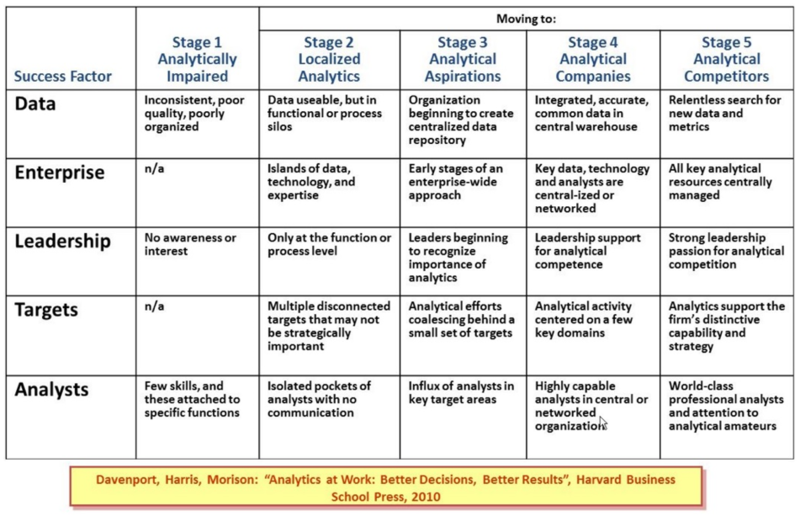 As you plan to drive Analytics into your business, take some time to understand the Davenport Analytics Maturity Model, and more importantly, those areas of Leadership, Enterprise, and Targets. Your likelihood for success will increase predictably!